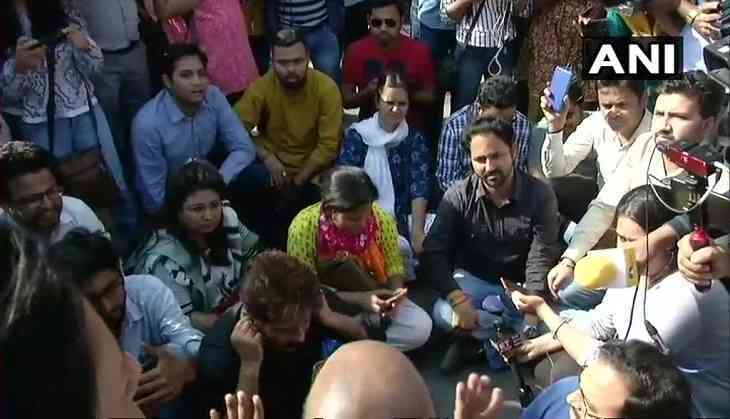 A large number of journalists belonging to various media organisations staged a protest outside the Police Headquarters in Delhi on Saturday, demanding strict action against police personnel accused of assaulting and molesting two female journalists. The journalists were covering a students' protest near the INA Market on Friday. Two female journalists filed two separate complaints against Delhi Police personnel, one for molestation and one for physical assault during a JNU march from the university to Parliament organised by Jawaharlal Nehru University Students’ Union and JNU Teachers’ Association. Aranya Shankar of Indian Express filed a complaint against Delhi Cant SHO Vidyadhar Singh for allegedly shoving her multiple times during the protest. The journalist also alleged that even after identifying herself as a journalist, she was pushed by him while being groped on the chest. The journalist is demanding the suspension of the said Delhi police officer. Both the journalists have also accused the police for not converting their complaints into FIRs which they claim is a violation of their rights. Both complaints have been registered at Sarojini Nagar police station. Verma also addressed the media persons staging a protest outside police headquarters, saying, “The police had to resort to water cannons and lathi charge to stop the violent protesters who broke barricades while marching. At that time, the police could not differentiate between protesters and journalists. It was a misunderstanding.” He also said both the women journalists’ complaints would be investigated. The JNU protest march was organised to demand the suspension of professor Atul Johri, accused of sexual harassment by multiple students. JNU students and teachers were also protesting the removal of some department heads for not complying with the varsity’s new attendance rules. As the hundreds of protesting students and teachers from the University marched towards Parliament, the Delhi Police undertook a baton charge and fired water canons on the agitators near the INA Market. Many students were also reportedly hurt during the scuffle with the police though no complaints by protestors have been registered as of now.